Welcome to, Be the Light podcast. This podcast is about building a positive momentum of change and healing by shining the light on teachers and wisdom so that we can be inspired to be the Light in our own life. Many people are looking for ways to be happier and have more peace. We are all meant to find our purpose and shine our light into the world. We are being called to bring healing, light, and the goodness that is in all of us deeper into our lives. Our world needs us, and it is time to listen. Hosted by Maria Kammerer, Professional Reiki Teacher/ Practitioner with over 16 years of experience in supporting people in healing. We will be sharing wisdom, teachings, meditations, happiness life hacks and wonderful moments with you. This is an invitation to find different teachers or practices that may resonate with you to help you to grow and expand your inner light. Huge appreciation goes out to Max Raphael at True Resonance for being all around musical genius for this project and sound engineer. His musical intellect and healing sounds create that sacred space within the podcasts that help resonate these powerful messages. Please check out his work at www.trueresonance.net. So grateful for my community for the continued encouragement, love and support without them this project would not have happened. So blessed and thankful to all the bright lights that have been a part of this offering of love and wisdom. A special thank you to the incredible teachers for sharing their time, wisdom and inspiration. We are so blessed to be alive during this time and to be able to offer and share these gifts with you. Photo credits go to Lucia Harmon, Max Raphael,Sarah Dailey and Kent Pilcher. We need positive things to focus on. It helps remind us of the good that is in the world and keeps us on a momentum of happiness. 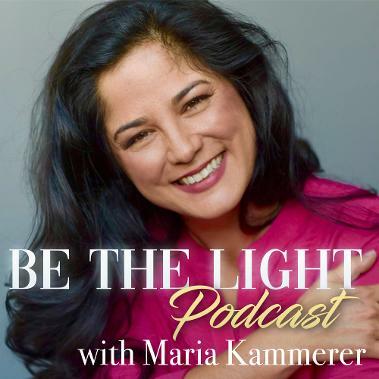 This introduction into the podcast series: Be the light by your host Maria Kammerer. She extends an invitation to listen deeply. To focus on your peace that is always present in you, ending with a guided meditation. Reiki has been that way of healing for me. Reiki, translated means spiritual energy, it is a system that helps us to let go of anger and worry and uncovers our peace and wholeness. In my direct experience the system of Reiki is a path of transformation – it opens us up to the knowing that in each of us is: true-self, wisdom, light, compassion, and healing. Reiki allows us to heal ourselves, and through each of us, we can be part of healing the world. There has been a lot of expansion on this journey. Let us continue to Be the Light for others; and listen to the teachings of current spiritual leaders and practitioners; expanding and cultivating the power of Healing, Light, and Peace that is our true nature. A conversation with Sister Insight, a monastic, Dharma teacher and student of Thich Nhat Hanh at Plum Village Mindfulness Center in the South of France. She shines the light on the many benefits of being conscious of our breath and shares a simple Mindful breathing practice. This conversation was recorded on location at Plum Village Mindfulness Center. We are so grateful to Sr. Insight for her beautiful sharing of the importance of mindful breathing. If you want to find out more about Plum Village and Mindfulness practice visit their website www.Plumvillage.org. Sister Rising Sun is a monastic, a Dharma Teacher and student of Thich Nhat Hahn at Plum Village Mindfulness Center. Sister Rising Sun shares the practice of repairing our relationship with ourselves and others called beginning anew. She reminds us we have an opportunity to look deeply at ourselves, our habits and relationships with a fresh perspective. A conversation with Joyce Singh, a member of the Order of Interbeing and sangha builder. The Order of Interbeing is a community around the world of monastics and lay people who have committed to living their lives in accordance with the Fourteen Mindfulness Training, a distillation of the Bodhisattva (Enlightened Being) teachings of Mahayana Buddhism. We invite you to enjoy the sound of the wind blowing through the aspen trees as Joyce shines the light on the gifts of practicing mindfulness in community or sangha. This conversation was recorded on location at Plum Village Mindfulness Center, Upper Hamlet. We are so grateful to Thich Nhat Hahn for his compassionate teachings, to the Plum Village Sangha, and to Joyce Singh for her warmth and for opening up her heart to those around her. If you want to find out more about Plum Village, or the Order of Interbeing please visit their website www.Plumvillage.org. A conversation with Christine Cheung, a member of the Order of Interbeing, Teacher, Author, and Business owner of Mindful Joyful Parenting. Christine shares a happy moment with me, her story of transforming suffering, and spontaneous singing. Hope you enjoy and remember that no matter how hard things can be there are many conditions for happiness present in this moment. This conversation was recorded on location at Plum Village Mindfulness Center, New Hamlet. We are so grateful to Christine Cheung for her mindfulness practice, for sharing her wisdom and compassion with us. Grateful to Thich Nhat Hahn for his compassionate teachings, for the Plum Village Sangha, and to all the dear teachers that have come before us. If you want to find out more about Plum Village, or the Order of Interbeing please visit their website www.Plumvillage.org. A conversation with Maryke Steenbergen, a mindfulness practitioner and massage therapist from Holland. Maryke shines the light on her favorite mindfulness practice with us, the practice of silence. Silence is a place for us to rest and nourish ourselves. We are so grateful to Maryke for her deep mindfulness practice and for sharing her peace and understanding. This conversation was recorded on the train from Plum Village to Bordeaux at the end of the 21 day retreat the Soulmate of a Buddha. Grateful to Thich Nhat Hahn for his compassionate teachings, for the Plum Village Sangha, and to all the dear teachers that have come before us. If you want to find out more about Plum Village, visit their website www.Plumvillage.org. A conversation with Frans Stiene, co-founder of the International House of Reiki and world authority on Reiki as practitioner, teacher, researcher, and author. His books include Reiki Insights, The Inner Heart of Reiki and many other impact-full titles. This conversation was recorded on location at Pendle Hill Quaker Retreat Center in Philadelphia during a four day Reiki retreat. Grateful to Frans Stiene for his many teachings and for his living example of Being Reiki in the world. If you want to find out more about Frans and the International House of Reiki please visit his website at www.IHReiki.com. Grateful to Max Raphael of True Resonance, www.trueresonance.net, for producing this Podcast and for donating his beautiful music for the intro & outro.